This is the lowest proportion since October 2016, though is actually not too far below the same month last year. The decrease was driven by continuing declines in the farmgate price, while retail prices remained stable during the month. However, compared with year earlier levels retail prices were 1% lower during January 2018. 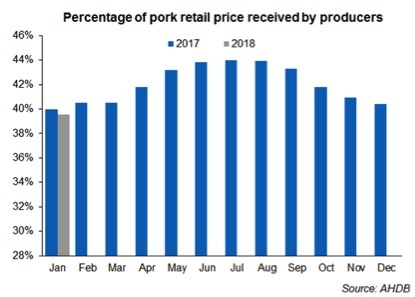 Prices for the majority of individual pork cuts reflected the overall trend and were stable during the month. However, compared with last January, most cuts were actually more expensive than in the previous year. 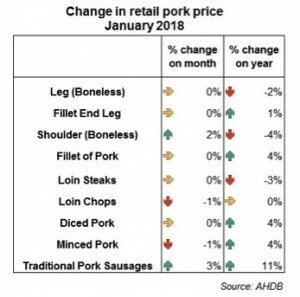 Boneless leg, shoulder and loin steaks recorded declining prices compared with 2017, and this likely pulled down the overall retail price level.